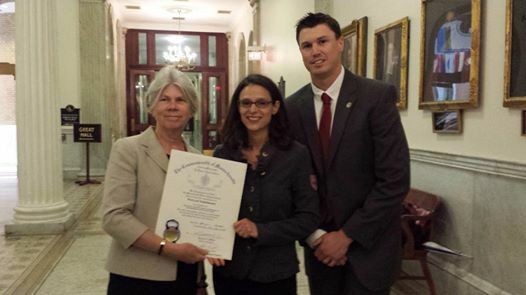 Theermann (center) with Representative Alice Peisch (left) and Officer Evan Rosenberg of Wellesley Police Department (right). For the third consecutive year, Wellesley Public Schools was again represented at the annual Green Difference Awards on May 28. Hosted by the statewide organization Project Green Schools, the ceremony took place on the Grand Staircase of the State House and featured recognitions of over 25 different schools, groups, administrators, teachers, and volunteers from across the state that helped “green” their academic communities this year. Wellesley was represented in the form of Phyllis Theermann, co-chair of Wellesley Green Schools, who received an Outstanding Commitment to Environmental Education award, presented by Gina McCarthy of the United States Environmental Protection Agency. The award was one of many given out by Project Green Schools to various people, schools, and organizations each year; others include Outstanding Green Principal, Outstanding School-led Project, and Outstanding Green Student. Award recipients are nominated by other parties from their home school district or elsewhere. Four years ago, Theerman started Wellesley Green Schools with a group of environmentally-active parents in the district. The group has spread to include a parent leader in every elementary school and active representatives with student groups at the middle and high school, all with cooperative oversight from Theermann along with Sue Morris, Jess Stanton, and Sara Bua. Theermann is also on the leadership team of Sustainable Wellesley and a former member of the organizing committee for the Wellesley Farmer’s Market. Among other things, Theermann was awarded for her work spearheading the winter’s no-idling campaign in town, which aimed to reward cars for turning off their engines and encourage those with their engines still running to do the same through informational handouts. As a co-chair of Wellesley Green Schools, Theermann was also involved in leading the organization’s efforts in “green”-certifying all elementary school classrooms across the district and pushing the middle school’s “Green Locker Green-Out”, where students are encouraged to reuse/donate or recycle as many materials as possible when cleaning out their lockers. June 2, 2014 in News.